CD review: "Blue Collar Blues"
Continuing a practice begun earlier this year with an album by Sonny Burgess of reclaiming rockabilly pioneers, HighTone now turns its attention to Billy Lee Riley, former backup guitarist to Roy Orbison and Jerry Lee Lewis. 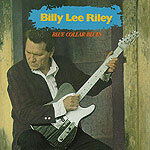 "Blue Collar Blues" doesn't focus on Riley as guitarist  in fact, he's not even listed as lead guitarist on the album credits  but on Riley as singer. It's not a bad idea; he comfortably switches from rockabilly to blues to country without a hitch. Of special note to those old enough to remember when rockabilly was still new are Riley's remake of his first and only hit, "Flying Saucers Rock 'n' Roll" (here titled "The Little Green Men") and the presence of saxophonist Ace Cannon, who played alongside Riley and Burgess when Elvis, Orbison, Lewis and Carl Perkins came storming out of Sam Phillips' Sun studios. This is good, soulful music; rockabilly and blues performed with passion and prowess.